Sliding glass doors or patio doors are quite common in many of our homes these days. While this is an excellent way to open up living space, and bring in the sunlight and natural beauty of the outdoors, like all good things, they have their drawbacks. Due to the large expanse of glass, high glare, damaging ultra violet rays, and heat are also brought into our homes. With the proper window covering on these doors, we can enjoy the benefits without losing more than we gain. 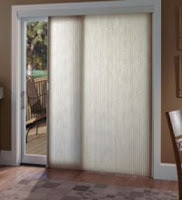 Virtually any type of window covering can be added to a sliding glass door. 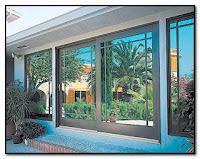 It is usually the case however that the sliding door is a high traffic door, and as such, traditional horizontal window coverings can prove to be heavy and hard to lift fully. 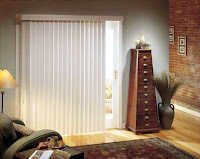 Typically, it is preferred that a vertical window covering is used, and that it opens the same direction the door does thus allowing for ease of operation. Today we have many options of vertical window coverings to choose from which allows us to create the exact look we want and have just the right amount of light control and privacy we require for any room in our home. Vertical shades are the most well know type of covering for sliding doors. These coverings have really come a long way in the design department. No longer are you limited to the commercial looking verticals, today verticals come in a huge array of styles and materials, allowing you to easily compliment any decor. 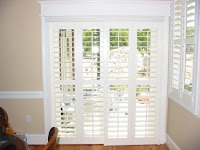 If you have shutters on the rest of your windows, fear not, you can also have bypass shutters custom made for your sliding doors. 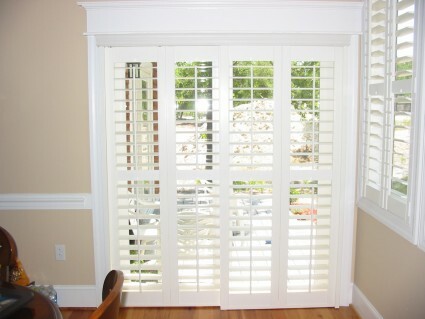 These shutters of course operate like traditional shutters, so you can control the amount of light through the louvers. Vertical cellular shades are not only an attractive alternative which allows you to carry the same type of window treatment throughout your home, they are also very energy efficient, and great for privacy. The only way to see through these blinds is to have them open. Panel Track coverings are modern, sleek and stylish. Available in multiple fabric types and densities you can filter light and view, or block it out completely. These coverings are great for large expanses as you can order them up to 16ft. wide if needed. 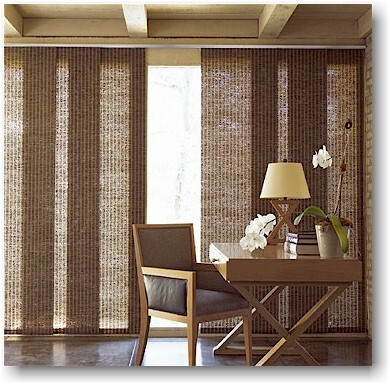 Made In The Shade, Inc offers these and other fine window coverings from multiple manufacturers. Another alternative may be Film or Sun Screens! If night time privacy is not essential a Sun Control Window Film is Ideal. If you want as much light as possible, then an Spectral Select film is ideal! Theses film allow in visible light but remove 99.9% of Harmful and Damaging light and as much as 98% of all Infra Red Light! You may chose a Dark Film which can be Reflective or Neutral and even non reflective! If you have City Light Views then a Dual Reflective is ideal! Sunscreens offer excellent Day time privacy and outstanding heat reduction! Day time privacy when your covering is open! Whatever your need in controlling Solar Energy through your glazing we can help solve it! Made In The Shade Inc. Where YOU Are The COOLEST!